This interesting mushroom grows on the deadwood of conifers (logs, sticks, stumps, etc.) across North America--and on the wood of picnic tables, fenceposts, and so on. It lacks a stem, or has only a stubby, lateral structure attaching the cap to the wood. Its brownish or orangish brown cap is finely fuzzy at first, but often becomes more or less bald with age. 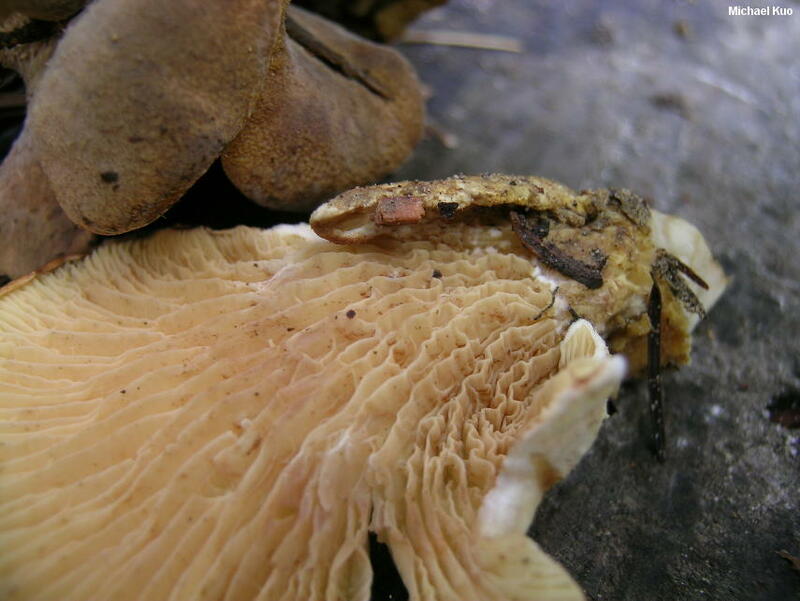 The most distinctive feature of Tapinella panuoides, however, is the orangish gills, which become crimped or corrugated near the base. Phyllotopsis nidulans is often cited as a look-alike for Tapinella panuoides, but it features brighter orange gills, and a bright orange cap. Tapinella corrugata is similar, but features brighter orange gills that are poorly formed for their entire length. Paxillus panuoides is a synonym. Ecology: Saprobic; growing alone or gregariously on woodland conifer wood and on lumber; summer and fall (also over winter in warmer climates); widely distributed in North America. The illustrated and described collections are from California. 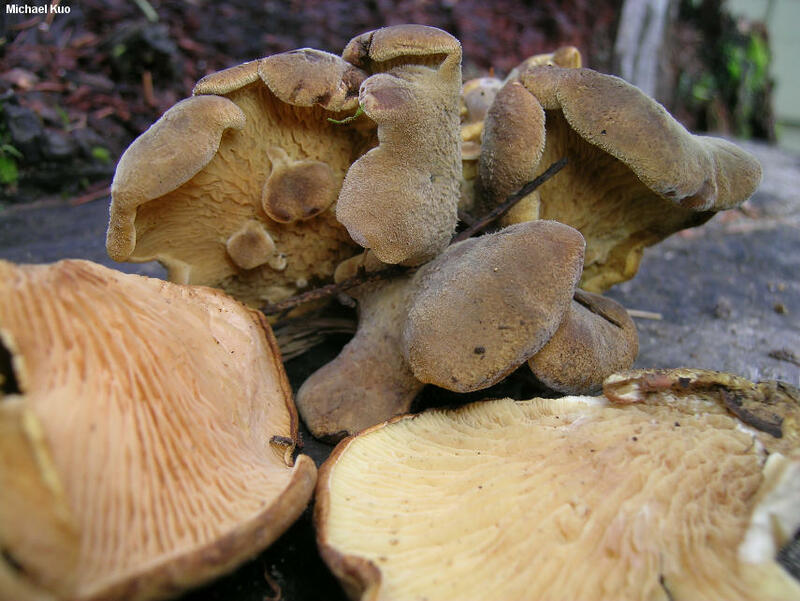 Cap: 3-8 cm; fan- or shell-shaped; planoconvex; dry; finely velvety when young, but sometimes becoming bald with age; tan, yellow-brown, or orangish brown; the margin inrolled at first, often with a somewhat scalloped appearance. 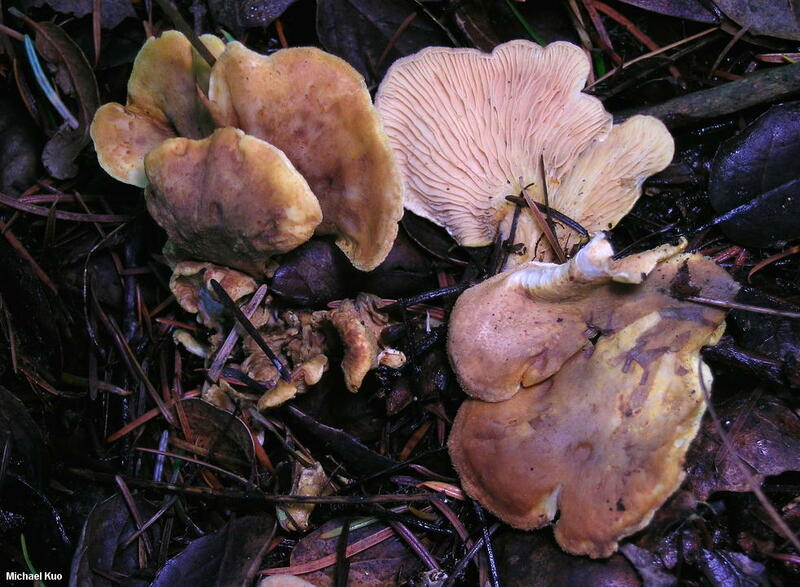 Gills: Close; dull orangish to yellowish; frequently forked, cross-veined, crimped, or corrugated, especially near the base. Stem: Absent, or present only as a small lateral extension. Flesh: Whitish or dirty yellowish; not changing when sliced. Spore Print: Yellowish brown or brownish. 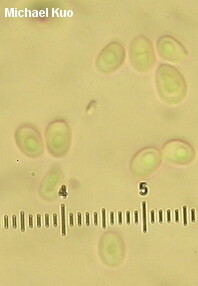 Microscopic Features: Spores 3.5-5 x 2.5-4 µ; ellipsoid; smooth; hyaline and uniguttulate in KOH; frequently dextrinoid. Hymenial cystidia not found. Pileipellis a cutis of hyaline-in-KOH elements 2.5-5 µ wide. REFERENCES: (Fries, 1818) Gilbert, 1931. (Fries, 1821; Saccardo, 1887; Kauffman, 1918; Arora, 1986; Lincoff, 1992; Barron, 1999; McNeil, 2006; Miller & Miller, 2006.) Herb. Kuo 01141107.